Happy in Body is all about healthy eating and how we can feel better in our clothes. It’s not all about weight loss, although that is the focus if you want it. A good diet can also resolve underlying medical conditions. Did you know that 98-99% of all diets fail because people gain the weight back as soon as they stop the diet? Happy in Body is unlike any other “diet”. By the end of the programme you will have a sustainable plan for life. You will understand which foods work for your body and which foods work against your body. There is a real need for us all to move away from punishment and deprivation when it comes to effective weight loss – it simply doesn’t work! Sugar will definitely be your enemy but everyone is different and we might discover that there are other things that bring us down or make us put on weight and that is what these personal plans are all about. When Claudia came to be for her new website design it was immediately clear that she is a professional. She genuinely cares about the people that she works with and ultimately helps to feel better about themselves. Claudia was putting a lot of effort into making videos, putting together her programmes and writing content for the website. 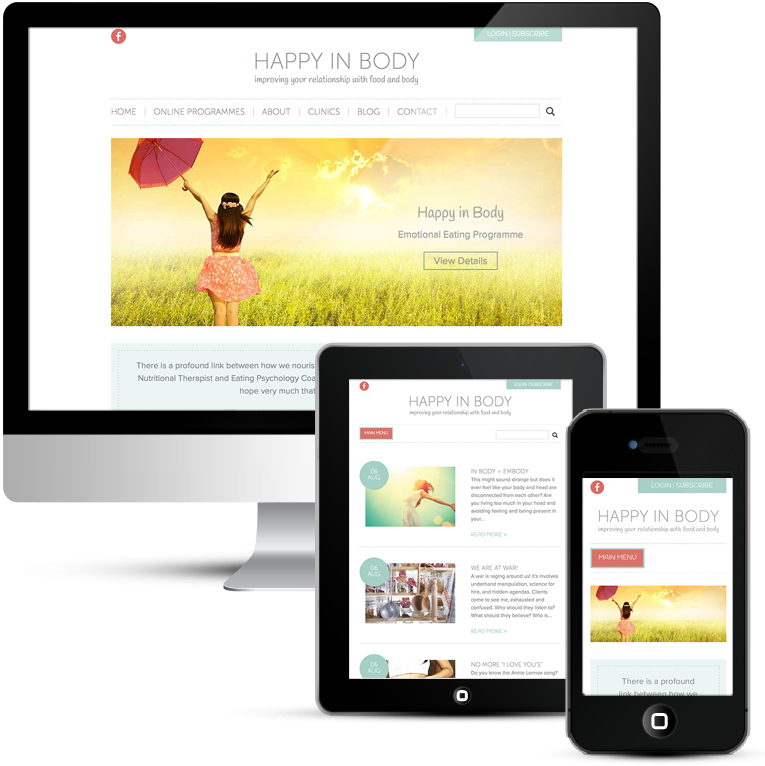 She is truly committed to her business and that means that the website design project will be a success, so both client and web designer go into it with enthusiasm. It also means that the website will not be a five-minute wonder because it is supporting a real business. I often get enquiries from people who want a new website to start their new business and that really is not the way to do it. The website should be used to promote your business but you need to have a solid structure first. You should already be operating, have tested the market and know that you have a business that will work. You need to know that people want your product or service before you even think about a website. Start on Facebook, start making money and then build a brand and launch your marketing campaign including a website. A website done by a professional web designer is a big investment so you need to be sure about your business. Claudia had got it all right, done it the right way around and this website design project was a pleasure to do.